The Hydro module consists of the Hydro resource and the Hydro component. The Hydro module is ideal for users who model systems that include conventional, small, or micro hydroelectricity generation. For run-of-river hydroelectricity, see the Hydrokinetic component. To access the Hydro resource options, click the Hydro button under the Resources tab at the top of the page. 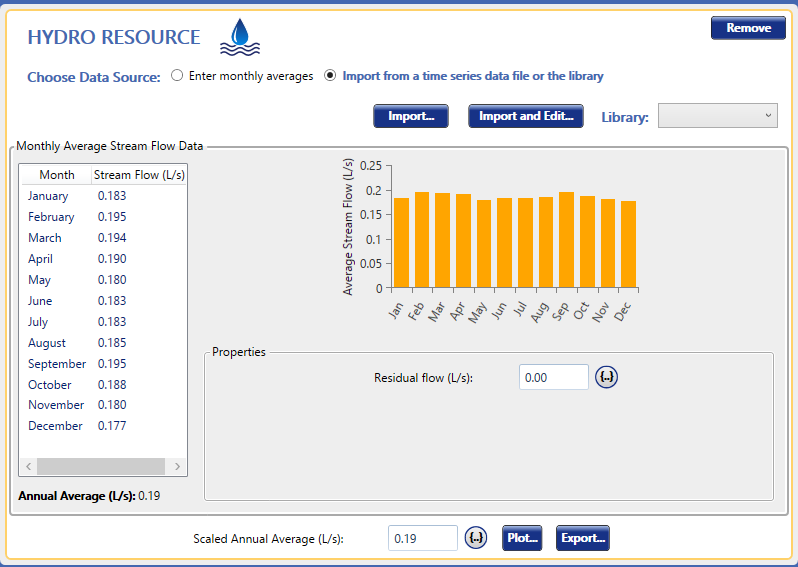 You can specify the stream flow in the Hydro resource, either as twelve monthly values, or as an imported time series. To access the Hydro component options, click the Hydro button under the Components tab at the top of the page. You can specify the cost, available head, design flow rate, operating range, and losses of your hydro system on the Hydro component page.